I can't stop thinking about last week's Second Life International Best Practices in Education Conference. 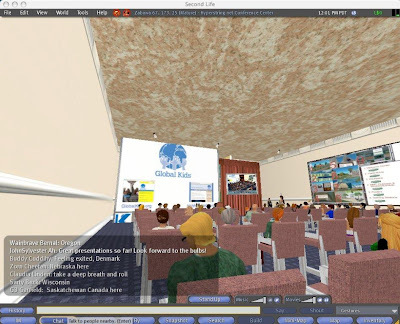 The experience was so immersive that I'm forced to admit that Second Life (as an educational tool) is not going away - as a distance education professional development tool it is simply too effective. How else can you gather thousands of people (from all around the world) into the same environment with such minimal costs and maximum benefits? Apparently, over 1,500 people attended the conference. At one point in the conference the presenter asked the participants to type in where we were located (see screen-shot below). Amazingly, I was "sitting" in a room with people from dozens of countries around the world. The presentations were also excellent. 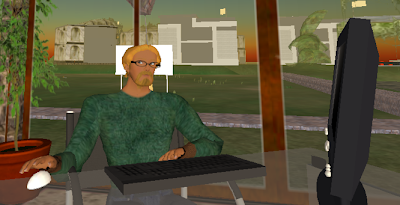 Each detailed ways that Second Life can be used in educational settings on all levels. If you missed the conference, or any of the sessions, I highly recommend browsing the conference archives - you can view/review video from any of the sessions listed thanks to SLCN.tv. Exactly like speakers do in normal, First Life conferences, each of the presentations included multimedia presentations to enhance the learning experience. Oddly, however, well over 90% of the pictures included in such presentations were made from screen-shots taken in-world (I suppose posting copyrighted material in SL doesn't fall within Fair Use guidelines). As an outsider looking in, huge kudos to the committee that put it all together. Specifically, I think that Ryan Bretag, Beth Ritter-Guth, and Eloise Pasteur deserve a well-earned virtual round of applause (everybody /clap) for the hundreds of hours they have put in for the cause. Once again, excellent job - when can we do it again?